A moment later, the man by the trees has moved on. He has not noticed his echo behind him, and the man who echoes him has not noticed him or, even if he has, has certainly not noticed himself noticing him. There are thousands of such echoes and agreements every minute. Almost all go unseen, and almost none are recorded, unless photography intervenes. 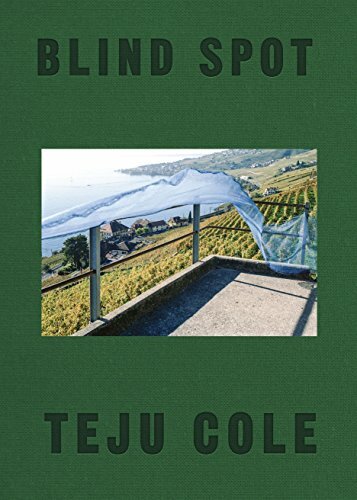 In Blind Spot, Cole creates a space in which to notice himself noticing—he’s the third echo in the series, and invites us to stand in as the next—and the result is something richer and more ambiguous than we might have anticipated. Instead of being explained away, the resonance of the more than 150 photographs Cole has taken and collected here is deepened for being met with such sustained and lyrical textual scrutiny, with the free forays of his capacious mind—one that’s often unconsoled but never merely disenchanted. I was on the 1 train on the way to work when it came to mind that he had been committed to earth for exactly eighteen years. In that time, I had complicated the memory of the day, not with other burials, of which I had attended only a few, but with depictions of burials—El Greco’s Burial of the Count of Orgaz, Courbet’s Burial at Ornans—so that the actual event had taken on the characteristics of those images, and in doing so had become faint and unreliable…Sometimes, in waking dreams, I imagined my father with coins on his eyes, and a solemn boatman collecting them from him, and granting him passage. Those “coins on his eyes” hark back to an earlier passage in which Julius broods on a shipwreck of slaves, some of whose bodies were recovered with relics traditional to their countries of origin. He has come to know his father, in the long remembering, as someone marked intimately by the sweep of history—and, so too, as a presence impossible to disentangle from artworks that might seem alien to that history. So they multiply, the complicating pressures on memory. And if much of the pathos of this passage arises from a muted sense of misgiving at the way memory and imagination spiral out from—and threaten to attenuate—the personal, part of the originality and force of Cole’s vision lies in its ultimate commitment to this same movement, its sense of the self as tending, in a rich indeterminacy, beyond the hard and fast dictates of biography. Years later, I lost faith. One form of binocular vision gave way to another. The world was now a series of interleaved apparitions. The thing was an image that could also bear an image. If one of the advantages of irreligion was an acceptance of others, that benefit was strangely echoed in the visual plane, which granted the things seen within the photographic rectangle a radical equality. This in part was why signs, pictures, ads, and murals came to mean so much: they were neither more nor less than the “real” elements by which they were framed. They were not to be excluded, nor were the spaces between things. “We see the world”: this simple statement becomes (Merleau-Ponty has also noted this) a tangled tree of meanings. Which world? See how? We who? Once absolute faith is no longer possible, perception moves forward on a case by case basis. The very contingency and brevity of vision become the long-sought miracle. I swear he just suddenly appeared. The angel is the one who communicates between realms. Hermes, medium, channel between things, gatherer of potentials, the flow station of being. Is this Indra, who was as precocious as Hermes was, borne on the winds as Hermes was? Or is it Ganesh, messenger of the gods, opener of roads, first port of worshippers’ call? Out in the sun that day, some kind of Catholic procession was going on, raucous around the old cathedral, but inside the café of the Datta Prasad Hotel, a hermetic air reigned. I raised my camera slowly. His glance took hold of me. “In a dark time, the eye begins to see.” Quite by chance, while I was taking a photograph of the one-eyed car in Zürich—late afternoon, and the sun was going from the streets—I heard a friend’s voice behind me. “Was machst du denn da?” She laughed. I turned around and saw in her eyes a gale force grief, for her mother had only just died the previous week. Cole has found himself in a row of stalled Bombay cabs, and a passenger in the next car but one has turned to look at him with an intensity that is as hard to ignore as it is to account for. There’s something staggering about the way text and image come together here to hit on a truth slantly, accumulating force by a shared indirection, looking head-on by looking away. We have to picture that “gale force grief,” and we see it more terribly for Cole’s not placing it before us. Part of what this pairing does so successfully is to meet us with a double sense of dislocation: that of Cole seeing past his friend’s casual laughter in Switzerland to something not spoken; and now, in putting the book together—its associations mimicking the work of memory—bearing us on to this man returning his glance in Bombay. The man is very conspicuously at a remove—the frames of four taxi windows come between him and Cole—and yet this framing has the effect of intensifying the instant’s exchange. Such is the sense of heightened concentration, of a zeroing-in, that it’s easy to miss a passenger bent over in the middle cab. To spot him is to inhabit even more fully a space of belated recognition, to live out Cole’s moment—on that street in Switzerland, taking a photograph other than the one we see—of awful clarity. Windless day. Optical bliss. Many years later, and only in the current century, the government agreed to a fund out of which they would be paid, these now grown children who had been taken from their families, tens of thousands of them, and placed as slave labor in farms all around the country, the Verdingkinder as they are known, the contract children, back when Switzerland was not as rich as it now is. The fund was about half a billion francs. What it could not salve was the memories for these children of unmarried mothers, these gypsy children, these poor children: the angry shouts, the cold nights that cut like a blade, the hatred we naturally bear toward the weak and helpless, the terror of the long days in those mountains with their rough stones and vertiginousness and mocking beauty. There was always bipedal grace in his poetry, the this helping the that, a forward motion. Years later his loss left me tottering. Something in the middle of a group of five. Something on the periphery: something first, something last. Something squeezed. Something brown. Something made of metal but susceptible to injury. Something designed for some other purpose. Something on the street. Something held up by others in its group. Something under pressure. Something exerting pressure. Something seen on the way to a rally in the time of Black Lives Matter. At the Ny Carlsberg Glyptothek in Copenhagen is a photograph of a Catholic procession in rural Southern Italy. Next to it is a high marble relief of a Roman ritual procession from around the time of the Ara Pacis. It depicts a number of women in profile. Between the relief sculpture and the photograph is the museum’s russet wall, split so that which section is in front and which is behind is hard to read. The relief sculpture looks in fact like a photograph of a sculpture, and is difficult to resolve into its three-dimensional form. The women from 1 b.c.e. are on the verge of crossing the red sea and joining their distant Italian daughters and sons. The facing photograph gives lovely life to this impression. Participants in the less ancient procession, captured in a photograph within the photograph, fix their eyes on us; the women of the Roman sculpture, set in profile, watch them in turn. An intervening sliver of wall does little to diminish the sense of a real looking, an achieved crossing—such is the charged space Cole has patiently created for us, image by image and passage by passage. Blind Spot is a book composed of such crossings, or the hope of such crossings. Cole says what he values is not the shock of the new but “the shock of familiarity, the impossibility of exact repetition.” Following his mind’s maneuverings, you grow newly sensitive to the superabundance of ordinary transformations that life presents us with. One image enriches, both leans toward and tenses against, another; quietly, somehow, things cohere. In one memorable sequence, a spectator approaches a sculpture in a Chicago museum in more than one sense, the man bowing his head to read a placard and, in so doing, assuming the pose of the sculpted child; both are then lent a probingly unlikely evocation on the following page, in the form of a man in a gray hoodie using a New York payphone; all these are then recalled by an angled lampshade in distant Tivoli. I had parked my car in the shadow of the overhanging rock above the precipice. A man walked past my car, went past the traffic mirror and red safety notice, and stood at the edge. He appeared to be a foreigner. He stood there for a very long time, maybe fifteen minutes. He had a camera but didn’t take any photos. I wondered what kind of life he lived, what his past contained, and how he came to be standing here in this faraway country, at the edge of the precipice. What was he thinking about, there ahead of me? After taking the photo, I walked past a car parked in the shadow of the overhanging rock above the precipice. I went past the traffic mirror and red safety notice and stood at the edge of the precipice. There was a man in the car behind me, a local, to judge from the plates. He just sat there, not moving, and with no change in his expression. When I turned around and walked past him, probably a quarter of an hour later, his expression was still the same. I imagined that he came here to the edge of the precipice to get away from a difficult life, to enter into aloneness, silence, the cool of the rock’s shadow. What was he thinking about, there behind me? Tomas Unger 's poems and essays have appeared in The Threepenny Review, Poetry Ireland Review and Literary Imagination. He lives in New York. A novel about food becomes so much more than some simple story of domestic affirmation found in the kitchen, because, in the end, we always have Grandma’s recipe tin. Instead, it becomes a story of food’s very foundational and fluid place in our understanding of the world. We are, in short, not watching movies -- or living our lives -- with the full capacity that once seemed so natural to us. We are more and more unable to submit, and our films and our lives suffer for it. Am I a bad literary person if I say Cole bores me to tears? Eat your vegetables! laugh. Cole is still young; he’ll outgrow his Sebaldosis and develop an edge, perhaps, after he passes through the inevitable period of neglect (when male Chinese writers become the flavor of the month?). He’s an intelligent writer and an Old School Aesthete… he’s just far too tame and “professional”. Give him 15 years and a few character-building setbacks. Writing out of gratitude is always going to give creamier results than writing for revenge. frog – with a name like that I can’t argue with you. Steve – eh, in my experience the more “established” a writer gets, he/she becomes MORE tame/professional. E.g. Ben Marcus, who once wrote sentences like “each leg was clothed in a contrasting food style” and now writes stories about writing professors teaching writing workshops (but on a cruise ship!). So I’m skeptical about Cole. But, all the power to him – not everyone can get a book about “notic[ing] himself noticing” published! That’s a young man writing for effect; not a careful writer getting at the truth of the matter. A quick look at an online image of “El Greco’s Burial of the Count of Orgaz” has got to leave you wondering which part of it complicates the narrator’s memory of the burial of his father. “Julius” isn’t Cole, but I’m not sure Cole thinks that Julius is being cringe-y, there. Likewise, if T.Cole writes out lines from Heaney to test new (quill?) pens, which lines from Gerard Manley Hopkins does he declaim while making love or frying potatoes? And that really is the kind of thing a young man/ writer may well grow out of. I first heard about Thomas Hardy’s Far From the Madding Crowd about twenty years ago, when I was in seventh or eighth grade. My classmates and I were all reading Stephen King and Dean R. Koontz, and our English teacher attempted to guide our reading choices to higher-brow material.”I think it’s great that you’re all reading so much,” she said. “But when you’re choosing books to read, try to read classics.” She mentioned, for example, that she had recently read Far From the Madding Crowd while recovering from surgery.I had no intention of abandoning King or Koontz, but I did check out a copy of Hardy’s novel from the public library. I tried to read it but didn’t get far. The first two paragraphs had enough unfamiliar vocabulary and tonal foreignness to repel me as a thirteen-year-old:When Farmer Oak smiled, the corners of his mouth spread till they were within an unimportant distance of his ears, his eyes were reduced to chinks, and diverging wrinkles appeared round them, extending upon his countenance like the rays in a rudimentary sketch of the rising sun.His Christian name was Gabriel, and on working days he was a young man of sound judgment, easy motions, proper dress, and general good character. On Sundays he was a man of misty views, rather given to postponing, and hampered by his best clothes and umbrella: upon the whole, one who felt himself to occupy morally that vast middle space of Laodicean neutrality which lay between the Communion people and the drunken section.It took me ten years to try another Hardy novel, Tess of the D’Urbervilles, which I read and loved after my first year as an English teacher myself. The pleasures afforded by Hardy’s fiction, I realized, require patience, a more mature appreciation of language, wider knowledge of the adult world, and a sense of the past. (Google is helpful, too, in deciphering Hardy’s obscure mythological and Biblical references. )This summer, as I picked up Far From the Madding Crowd for another go, I was better equipped to appreciate Hardy’s wryly delicate humor in passages like the following: “It may have been observed that there is no regular path for getting out of love as there is for getting in. Some people look upon marriage as a short cut that way, but it has been known to fail.”Funny – and, indeed, as in Tess and The Return of the Native, in this novel Hardy concerns himself with love’s entanglements. Bathsheba Everdene, a young and imperious beauty, named for the woman who occasioned King David’s sinful plotting, finds herself involved not in a romantic triangle, but a romantic quadrilateral, as three men vie for her affections. Their names, like hers, are evocative of their identities: Oak, the solid shepherd; Boldwood, the increasingly audacious farmer; and the Troy, the scoundrel as fallen as the citadel that is his namesake.There’s a reason that the romantic triangle is such a commonly-used fictional device: it has a geometric elegance, a pointedness that keeps a story moving. The romantic quadrilateral is harder to make work. Hardy does it well enough that 135 years later people are still reading the book. Compared to later works like Tess and Native, though, this one – the earliest of Hardy’s best – known novels – is a bit of a disappointment.For one thing, it lacks a narrative center. This romantic quadrilateral is nothing so neat as a square or a rectangle. It’s more ungainly – an irregular trapezoid, perhaps. It’s difficult work to set up three suitors in a reasonably rounded way, and while Hardy’s developing one, the other two tend to fade to the background. In the end, the male characters come perilously close to being as wooden as their names or, in Troy’s case, a bit too starkly villainous.At times the plot’s contrivances seem arbitrary, meant to force the narrative (originally published serially in a magazine) in its intended direction without especial regard for plausibility: Oak lies down in an apparently abandoned wagon, whose owners return and just so happen to be heading to Bathsheba’s farm; Troy nearly drowns and, believed dead, runs off to America to join the circus for a convenient span of time, returning just when his presence will cause the most upheaval.Bathsheba herself, vain, proud, described by one of the men who marries her as “this haughty goddess, dashing piece of womanhood, Juno-wife of mine,” seems to be a rough draft for Eustacia Vye, the more famous heroine of Hardy’s Return of the Native. Eustacia (a favorite of Holden Caulfield’s, you may recall) is, in Hardy’s description, “the raw material of a divinity. On Olympus she would have done well,” he writes, for “she had the passions and instincts which make a model goddess, that is, those which make not quite a model woman.” In comparison to Eustacia, Bathsheba is too kind, too mortal, and less vivid.In other ways, too, Madding seems a rough draft of Native, which arranges its characters not in a triangle or quadrilateral, but in overlapping Venn diagrams of desire. In both novels, some characters come to tragic ends, some are seared by their experiences but survive, chastened but wiser. Return of the Native was published in 1878, four years after Far From the Madding Crowd, and in most ways it’s a better book. It has a sharper sense of place; a more forceful narrative arc; more emotionally weighty and realistic plot turns; and, despite a rather tedious beginning in which backstory is provided by the gossip of eccentric country folk, less of such stock characters, whose humorousness has not aged well.I guess you could say that my eighth grade teacher gave me a bad recommendation. After all these years, finally reading this novel was a bit anticlimactic. But in the larger sense, she was right: King and Koontz may have been fine for my adolescence, but ultimately they were bridges to more ambitious reading projects. My teacher’s offhanded remark about Hardy stuck with me, giving me a sense of the rewarding places to which those bridges might lead. Though I might have skipped this particular novel without much of a loss, Hardy’s best work is definitely worth the journey.